Even if you aren’t allergic to wasps or their close relatives, a wasp’s sting is still painful and their presence near your home or business is a nuisance. Should I Remove a Wasp Nest on my Own? Wasps are social insects, grouping together to build nests and populating quickly. Most often these nests can be found under roofs or the eaves of a home or commercial building. But wasp nest removal without the assistance from professional pest control experts may not completely remove your wasp problem. Some wasp colonies will build their nests in difficult-to-locate spaces such as inside a fallen tree or hidden nooks along a building. Unless you know where to look, you may miss those spots giving the chance for wasp populations on your property to multiply exponentially. 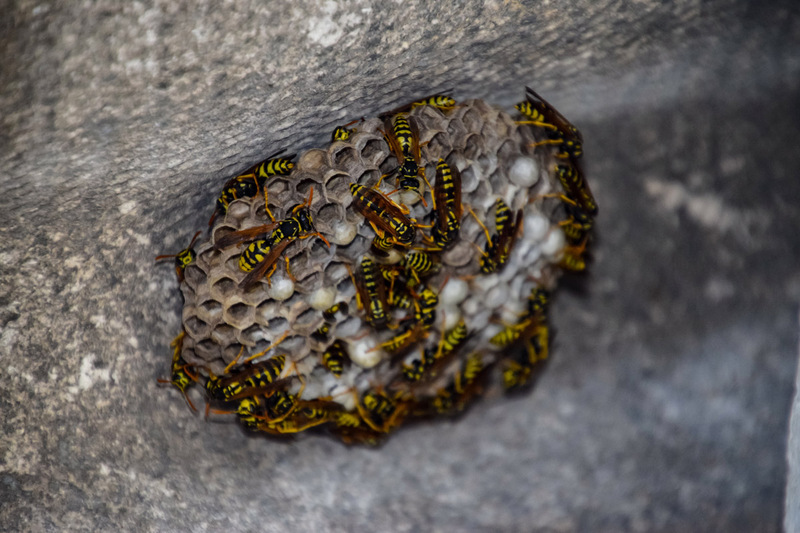 For complete wasp control and wasp nest removal in Utah County locations, including Eagle Mountain and Lehi UT, call H2 Pest Control! What makes us the best pest control professionals when you need to safely remove a wasp nest? Same-day wasp control: The sooner you call for wasp nest removal, the sooner you can avoid a larger wasp infestation. H2 Pest Control provides wasp control services the very same day you contact us. We understand the hassle of having a wasp population surrounding your house or even making their way inside your home. Our team will arrive at your property promptly to remove the problem quickly and effectively. Certified wasp removal experts: Our certified technicians at H2 Pest Control have been providing pest control in Utah for years. We know how to not only locate spots where wasps have or will build nests, but how to remove nests and protect against more wasps in the future. We will provide your home or business comprehensive wasp pest control for total protection. Eco friendly wasp treatments: H2 Pest Control is committed to protecting homes and businesses from common pests, while also protecting the environment, your family and your belongings. Our wasp treatments won’t stain or leave lasting odors that could pose a health hazard. They are environmentally friendly solutions that are safe to use around homes with pets or children. Call H2 Pest Control today for same-day wasp removal and long-term wasp control! Protect and prevent against wasps at your home or commercial property in Lehi, Eagle Mountain, and all throughout Utah County.